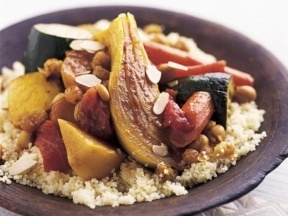 To serve, spread the couscous over a large serving platter and, using a slotted spoon, mound the vegetables in the center. Pour some of the broth over the vegetables and sprinkle with the almonds. Pass the remaining broth and the harissa, if desired, at the table.